When people talk about history being such a strong presence in Boston and the city having such a sense of the past, they tend to mean the Freedom Trail and the sight of so much red brick. Maybe an even better example — certainly, a livelier, get-a-good-deal-on-your-fresh-fruits-and-vegetables example — would be Haymarket. You can get fresh fish, meat, and cheese there, too. Here’s an unmediated, on-foot, face-to-face place. Wandering among the vendors there on a Friday or Saturday comes as close to visiting the Boston of a century ago, or almost two centuries, as any experience the city has to offer. Paris no longer has Les Halles. 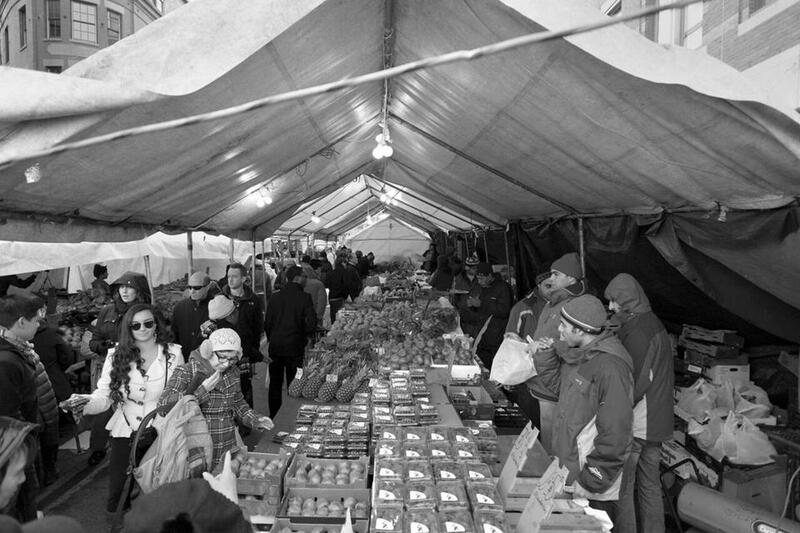 The produce market in Covent Garden moved to southwest London in the 1970s. The 196 vendors in the Haymarket Pushcart Association remain very much in business. Haymarket’s vitality clearly comes through in “Haymarket, the Soul of the City.” The show runs through Aug. 30 at Suffolk University’s Adams Gallery (a half-mile walk from Haymarket). Justin Goodstein’s 45 photographs are both celebration and examination, bringing together history and sociology and merchandising and lots of local color — color that comes through even in black-and-white images. Haymarket is also “a cultural melting pot,” as Goodstein calls it, a stew of characters and ethnicities. As much as the personality of the place, what comes through in the show is the personalities of the people who work there: Otto Galloto, Sal, Jonathan and Sina Chhim, Joey Omessimo, Frankie, Roy Fournier, Fishy Joe, Jess, Salim Marhamo. Enhancing that sense of personality are excerpts from interviews conducted by curator Ken Turino and a video. Turino works for Historic New England, which organized the show. There’s a nice irony in Historic New England’s involvement. That excellent organization, formerly known as the Society for the Preservation of New England Antiquities, is usually thought of in terms of handsome old houses with fine, if understated, Yankee furnishings. 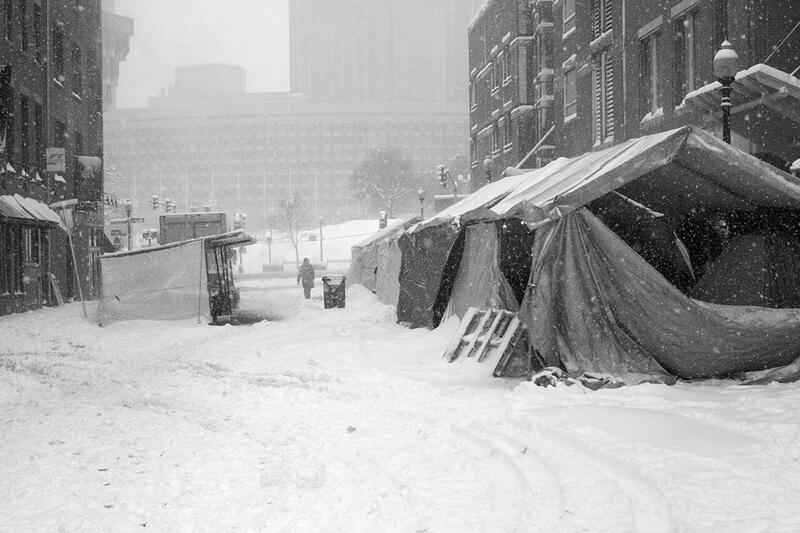 In some ways, yes, Haymarket is a throwback to the heyday of cold roast Boston. But there’s nothing antique — or at all Yankee — about it, unless getting a bargain and carrying your own bundles count. Adams Gallery, Suffolk University, 120 Tremont St., through Aug. 30, 617-573-8447, suffolk.edu/AdamsGallery .